Have spent over a year with the product as Senior Design Manager, from a team of one designer to six. Creating experience for Cortana proactive and reactive across difference canvases of desktop, phone and Cortana on Edge browser. Graphics in Office is a team that works across art objects like pictures, tables, shapes, charts and smart-art. With Office for touch the challenge for the design team was to re-imagine the interaction while keeping the familiarity of the Office personality and behaviours. Working both as individual contributor and lead, successfully delivered experiences for pictures and smart-art across devices. Worked with Windows OS division, on utility apps primarily the Alarm and Clock universal app on Windows for Threshold (Windows 10). Also worked on a Conversation and Collaboration app for Microsoft education group apart from other hack projects. Few years ago Yahoo! embarked upon a redesign exercise across all it's properties to create great media consumption experience across all devices and platforms. The project got shelved after almost 6 months of work post organization/leadership changes. However, working on the project was a great experience as visual designer. Explored and ideated on the Yahoo! personality and rich media experience across devices. Yahoo! Cricket was launch day app for Microsoft Windows 8. The work involved understanding Windows 8 app paradigm, re-create the Yahoo! Cricket content to a richer immersive native app experience. Also worked on the Live Score page of yahoo! Cricket, the most accessed portion of Yahoo! Cricket. Worked across Yahoo! Small Business Hosting and Merchant solutions along with revamping the Yahoo! Small Business India. Also worked on a big vision project of integrating Yahoo! Merchants and Local businesses with Business Centre portal. 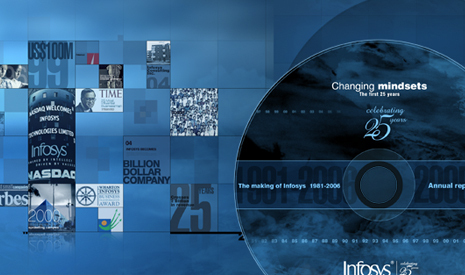 Marking the journey of 25 years of Infosys, from a small apartment to over 100K employee company, this interactive timeline reached many more places than intended for. A range of projects done from enterprise apps to IPTV interfaces to mirror kiosks, print and branding work at Infosys. A collection of some of the projects done in the life before Infosys. Copyright © Varshesh. All Rights Reserved.